"Charlie, lighten up when you spar." 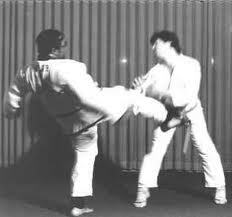 A young adult student, Charlie, has recently developed a bad attitude when it comes to kumite. I'm not sure where this comes from - he certainly didn't learn it here. When he goes up against more advanced students he's wisely conservative, even diffident. Good manners and control go out the window, though, when Charlie is paired up with someone who more closely approximates his skill level. I've confronted Charlie about this and warned him that this behavior would not be tolerated. I explained to him why we bow (rei) in the dojo. Controlled techniques; no brawling or reliance on brute strength. Stay out of the face and keep kicks above the waist. Sweeps, grabs, and the occasional take-down are permitted, but no ground stuff. This is karate, not BJJ. Respect your sparring partner. Do not deliberately intend to hurt her/him. Foul play, especially if I detect bad intentions, will get you the heave-ho. Yesterday was Charlie's last day at our school. He was advised not to return.